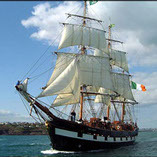 The Jeanie Johnston is docked at Custom House Quay in Dublin’s city centre and is an accurate replica of the original ship built in Québec, which sailed between Tralee in Co. Kerry and Canada between 1847 and 1855. The ship is OPEN FOR VISITORS with guided tours being conducted daily. A tour of the re-created Jeanie Johnston enables visitors to see what it was like on board a wooden tall ship during the Famine era. The tour will convey a deep sense of history and will to be a memorable experience for all who come on board. 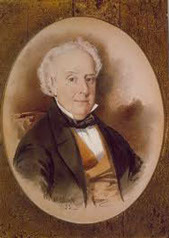 Colonel Thomas Talbot (1771 -1853), who is a well-known figure in Ontario, Canada, was born at Malahide Castle near Dublin. He emigrated to Canada in 1791, at age 20, and became personal secretary to John Graves Simcoe, Lieutenant-Governor of Upper Canada. 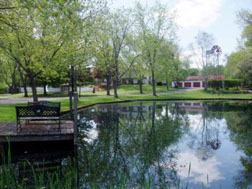 He supervised the settlement of 29 townships, one of which is called Malahide, along the North shore of Lake Erie, in the early 1800s. And from 1814 to 1837 he settled 50,000 people on 650,000 acres in the Thames River area. 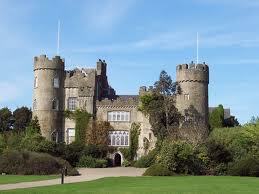 Malahide Castle and seat of the Talbot family since 1185.